EVENT PLANNING is the process of planning a festival, ceremony, competition, party, concert, or convention. Event planning includes budgeting, establishing dates and alternate dates, selecting and reserving the event site, acquiring permits (alcohol permits, insurance licenses, etc), and coordinating transportation and parking. Event planning also includes some or all of the following, depending on the event: developing a theme or motif for the event, arranging for speakers and alternate speakers, coordinating location support (such as electricity and other utilities), arranging decor, tables, chairs, tents, event support and security, catering, police, fire, portable toilets, parking, signage, emergency plans, health care professionals and aid stations, and cleanup. 10 World Famous Event Planning Companies - Social Tables. 25 Most Influential Wedding Planners in the World - EPU. A Voyage into International Event Planning - Upwork. How Anna Wintour’s Longtime Party Planner Turned to Trump - The New York Times. Elsa Maxwell - (1883-1963). American gossip columnist and author, songwriter, and professional hostess renowned for her parties for royalty and high society figures of her day. Maxwell is credited with the introduction of the scavenger hunt and treasure hunt for use as party games in the modern era. IAPO International Association of Professional Event Planners - membership association created to provide education and business development services for people working as, or studying to become, a professional event planner. Liz Taylor: How I became party planner to the stars - "LIZ Taylor organises birthday bashes and other events for royalty and showbiz. So how did she find herself turning Prince William and Jon Bon Jovi into a double act?" Need Models for Your Party? There’s an App for That - The New York Times. POKEN - "Collect people and things with a touch." Poken is revolutionizing the event industry with its innovative and simple solutions to generate high quality leads, get unprecedented insight into people's interests, and boost networking between participants. We provide tools and technology for tradeshow managers, exhibitors and event organizers to create interactive and exciting events, while measuring the return on investment of their lead generation activities. Robert Isabell - (1952-2009). American event planner who was behind lavish and innovative events including weddings and funerals of the richest and most famous. He helped make Christmas at the White House during the Presidency of Bill Clinton and helped create innovative events that made Studio 54 in Manhattan into the place to be in the late 1970s and early 1980s. Saatchi Gallery - "Venue hire at The Saatchi Gallery is the perfect opportunity to experience the unique grandeur of Britain's most exciting contemporary art museum and enjoy your own private view of the work on display at the same time. Venue hire at The Saatchi Gallery is easy to organise and offered at very competitive rates for private parties and corporate functions alike." Secrets of the royals' party planner, Lady Elizabeth Anson - Daily Mail. Top 15 event planning blogs - Event Planning Blueprint. 5 Star Chef Solutions - "Our Culinary / Event Director will match you with the perfect private chef to make you next event a truly memorable experience." The Hamptons, Long Island, New York City, Fairfield, CT, U.S.A.
Bassett Events - "With over 15 years in the event planning business, Bassett Events has the team in place to ensure that your event is a memorable, exciting event that will be talked about for a long time. We create branding ideas that are fun and surprising. We brainstorm ways to incorporate your company's brand into the most unlikely aspects of your event whether it's through the food, décor or service to really make a lasting impression." Toronto, Canada. Berkeley City Club - founded in 1927. 2315 Durant Ave., Berkeley, California, U.S.A. Formerly known as the Berkeley Women's City Club, was organized by women in Berkeley, California in 1927, to contribute to social, civic, and cultural progress. It is no longer restricted to women, and is available to the public at large for weddings and other occasions. BOMPASS & PARR - "The studio now consists of a team of creatives, cooks, designers, specialised technicians and architects. With Sam Bompas and Harry Parr the team works to experiment, develop, produce and install projects, artworks, jellies and exhibitions, as well as archiving, communicating, and contextualising the work. Bompas & Parr also collaborates with specialist technicians, engineers, artists, scientists, musicians and many other disciplines to create wondrous events." Brivatum - "Events and experiences in Finland and globally, for all budgets, from affordable to luxury, with over 18 years and 1100 events experience." Our services will save your company a lot of time, effort and money, since you can completely focus on your work - we will fix everything else! From us you can get whatever you need: well-being sessions, training days, recreational activities, summer festivities, Christmas parties, product launches, tours and several other events! Bubble - "Dare to Dream the Impossible." French Riviera Events. Our events agency is based in the heart of the French Riviera: Monte-Carlo (Monaco). We have been producing and managing various upscale events for years in Cannes and Monaco as well as abroad. From small groups celebrating a birthday to big companies launching a new product, we will be at your entire disposal to offer event production solutions. Bubble - since 1999. "Innonvative event catering in London." Bubble’s stunning menus can often steal the show, but our outstanding production services also play a key part in creating a truly extraordinary event. We regularly host high profile launches, opulent private parties, A-list film premieres, fashion shows, press events, glamorous weddings, large scale conferences, brand experiences and corporate receptions where attention to detail in a stylish environment is a fundamental requisite. Bubble’s capabilities include entire project management; venue finding, liaison and site inspection; event design and styling; flowers; lighting, sound and AV; photography and videography; entertainment; transport and valet services. COLIN COWIE - South African lifestyle guru and party planner to the stars, television personality and writer. "Colin Cowie is the gold standard in weddings, events and milestone celebrations. For more than 25 years, Colin and his team of world-class event producers have taken creative, all-encompassing experiences to new heights, setting trends that have transformed the world of weddings, events and entertaining." Creative Edge Parties - "Not just another chicken dinner." The most prestigious catering and event planning company in New York and Miami. From corporate events, to casual cocktail parties, from formal weddings, to intimate gatherings, our staff works tirelessly to orchestrate your ideal event. When it comes to celebrating life’s milestones – large or small - Creative Edge Parties is the place that can make the impossible, possible. david beahm Experiences - "Events Elevated." New York Event Design. David Beahm is one of America's top event designers. Known for his inventive work and trademark lavish flower creations, he has designed countless weddings for society, high profile and discerning clients, including Catherine Zeta-Jones and Michael Douglas, as well as a host of celebrity and Fortune 500 corporate events. He includes among his diverse corporate client base such well-known names as: Target, The Discovery Channel, Champagne Perrier-Jouet, Van Cleef & Arpels Jewelry, Victoria's Secret Beauty, Christian Dior, McDonald's and Louis Vuitton. DAVID TUTERA - designing spectacular events and transforming it into a lifestyle. Awarded by Life & Style Magazine as the "Best Celebrity Wedding Planner." Debi Lilly - "A Perfect Event." Our full service, start to finish design concept makes A Perfect Event the ideal place for event planning, floral and graphic design, shopping or just plain seeking style chic. Our service is highly personal. Based in Chicago, IL, U.S.A.
DH CATERING - Honolulu, Hawaii, U.S.A. "From vintage luaus to high-end celebrity events, we offer a wide range of wedding and event services including design, planning + coordination, unique locations, food and bar catering, florals + decor, entertainment, audio-visual, still photography, videography, custom itineraries, travel & concierge services and more. ELEGANT AFFAIRS - "Caterers and Event Planners in New York City, Long Island and the Hamptons." The premier off-premise caterer in New York City, Hamptons, and the Gold Coast of Long Island. They provide five-star cuisine, stellar presentation, and flawless service at every event. Catered corporate events include; product launches, corporate cocktail mixers, team building events, employee appreciation celebrations, holiday parties, non-profit galas, fundraisers, and celebratory dinners. ELEGANT AFFAIRS - since 1992. "Indian Wedding Decorations & Wedding Decoration in New Jersey, New York City." Now, with over twenty years and 8,000 events worth of experience. Specializing in exquisite wedding décor, unique floral creations, and one-of-a-kind structural designs, Elegant Affairs has had the honor of working with distinguished individuals, celebrities and major corporations from Fortune 500 companies - United Airlines, Delta Airlines, Goya, Citibank, MetLife, and HSBC, to name a few - to government institutions and nonprofits. EVENT Fusion - "With over a dozen years of experience in the events industry both in the UK and abroad, Charlotte Wolseley Brinton offers a fun, friendly and positive 'can-do' attitude which ensures personal responsibility is taken to deliver the very best event. Her reputation in the industry and in-depth experience puts her in a unique position to offer a bespoke service to her clients." EVENTIQUE NYC EVENT PLANNING COMPANY - "Innovative Concepts. Production. Entertainment." Our professional and devoted staff are experts at organizing and executing any and all types of events. Whether you are planning an upcoming corporate team building event, conference, holiday party, casino night, carnival/festival, red carpet event, concert, school function, gala fundraiser, wedding, or any other type of event, be it large or small, we can provide any and all aspects. Everything is at your fingertips and completely customized for your individual needs. EVENTMAKERS - established in 1990 is a global event production and destination management company specializing in connective marketing through live events, trade show booth design & fabrication, convention logistics, business theater, and destination management. Eventmakers is based in Los Angeles, and is ranked by Special Events Magazine for seven consecutive years as one of the Top 50 Event Companies in the World. EVENTS & COMPANY - "Customize Your Corporate Event." Based in Paris since 2004, EVENTS & COMPANY specializes in unique, customized corporate and institutional events in the French capital and other parts of France. FUN EVENTS GROUP - "Corporate Event Design Specialists. We deal exclusively within the travel & events industry and specialised in creating unique features that enable both individuals and corporate delegates to enjoy amazing fun experiences all within the 36 countries we operate." GBK Productions - since 2000. "Marketing, Public Relations, Fundraising and Special Events company dedicated to providing high quality, tailor-made service to its individual clients." Grace Kennedy Event Design - "Luxury Event Planner London." Event Design Company that creates the finest events. We have over 20 years experience in Event Management. Our experience covers every kind of event imaginable, including private parties and receptions, luxury weddings, charity balls, corporate events, summer balls, award ceremonies, product launches, themed events, film premieres, after-show parties... and much more! HIGHLIFE ASIA - "Event Management and Concierge." Shanghai-based Highlife Asia is a luxury concierge company working with global brands to provide clients bespoke lifestyle assistance. International Event Company - since 2007. "Premiere event planning firm based in Beverly Hills. We specialize in upscale social events, including weddings, bar and bat mitzvahs, anniversary and birthday parties, as well as corporate events including holiday parties, appreciation dinners, and much more!" KAI'S CATERING + EVENTS - "For almost two decades Kai’s Catering + Events has carved out a position as one of the leading boutique catering and comprehensive event planning companies in Los Angeles." Karla - "Conceptual Event Experiences." Full-service event planning, design, and production firm creating extraordinary events for discriminating private and corporate clients. Under the direction of owner Karla Dascal, KARLA has become one of the most sought-after and celebrated event companies dedicated to orchestrating the perfect experience or occasion. KARLA events are personalized to reflect the distinct tastes of each client, whether it be an individual, corporate entity, or luxury brand. Each and every design element is masterfully crafted and impeccably executed to create the perfect balance between form and function, precision and elegance. Based in Miami, FL, U.S.A.
Love Luck and Angels - since 2002. "Event Design And Coordination By Jo Gartin." Celebrity lifestyle and wedding planner to the stars offers more than just event coordination. LUXURIOUS WEDDING - couture wedding planner and international luxury wedding planning. Luxury experts by area. Marcy Blum Associates - "I am an eventiste, a designer of festivities, blogger and unapologetic lover of parties." Marcy Blum is an American "eventiste" who is the owner of the event planning company Marcy Blum Associates based in New York City. Marcy is a graduate of The Culinary Institute of America and began her career in the restaurant business, later creating a segue into the then developing field of event planning. In 1986 she became one of the first in the industry to develop the vocation into a successful career. Blum has also been a guest on the CBS Morning Show, The Today Show, Live with Regis and Kelly, The Oprah Winfrey Show and most recently Rocco's Dinner Party and The Nate Berkus Show. MILLIONAIRE'S CONCIERGE - "Ultimate Event & Destination Planner." Your Access To The Most Inaccessible VIP Events & Experiences Worldwide. Mindy Weiss Party Consultants - since 1992. "Based out of Beverly Hills, Mindy Weiss is a full-service event planner that has successfully grown her brand to become a lifestyle expert with books, product lines and spokesperson partnerships." MONTE-CARLO WEDDINGS - since 2005. "Your wedding planner on the French Riviera." Monte-Carlo Weddings offer full-service, luxury wedding planning services for clients around the world. Based in the Principality of Monaco and planning weddings across the entire Côte d'Azur. One Concierge - "One Concierge is a leading global provider of concierge & lifestyle management solutions. We offer a variety of bespoke membership options, personal/corporate concierge solutions & luxury VIP services to some of the most discerning clientele around the globe. Our relationships, insider knowledge & industry exposure enable us to deliver, the unattainable, 24 hours a day, 365 days a year." PB ACTION - largest event-planner agency in Europe with over 25 years experience as a full-service organizer of company events, anniversary celebrations, happenings, huge concerts, global events with thousands of guests. Preston Bailey - "Globally-celebrated for his unique ability to transform ordinary spaces into lush, theatrical environments, Preston Bailey is known as the premier event designer for a client roster that includes celebrities, royal families, CEO’s and athletes. Known for his ability to transform the dreams of his clients into reality, Bailey is often sought out to create never-seen-before designs that serve as backdrops for some of the most memorable moments of their lives." PURE ENTERTAINMENT GROUP - since 2008. Global bespoke event management and luxury concierge company based in Montreal, Canada. The company offers premium concierge services, bespoke travel packages and luxury lifestyle experiences to discerning individual and corporate companies all around the world. QUINTESSENTIALLY EVENTS - "The World's No. 1 Event Company." Multi-award-winning, international event management company delivering exceptional events around the world for leading luxury and lifestyle brands and discerning individuals. Established in 2005 we are defined by our results-orientated service and creative approach and we have been behind some of the most exclusive high end events and brand experiences of the past 10 years. 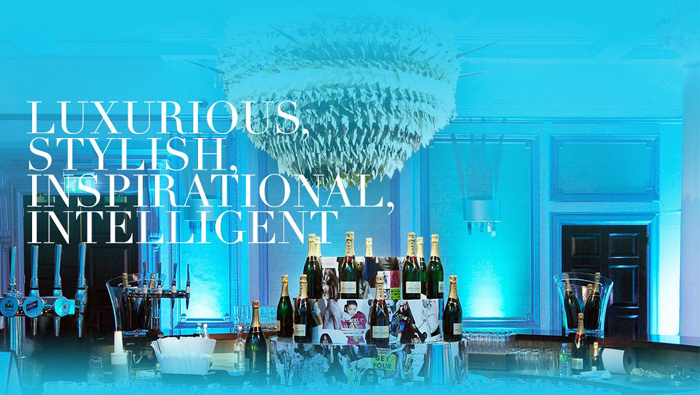 Established in 2005 by Anabel Fielding and Caroline Hurley, Quintessentially Events has offices in London, Côte d’Azur, Geneva, Dubai, New Delhi, Hong Kong and Singapore. We have the capability to create legendary experiences wherever in the world you may be. Rafanelli Events - "One of the nation’s premier event planning and design companies. We work with clients as unique as the events we plan; individuals and families, Fortune 500 corporations and non-profit organizations. For each, Rafanelli Events has provided unforgettable memories. With offices in Boston, New York, and Palm Beach, our team has concepted, designed and executed exceptional events since 1996. From weddings and private parties to corporate events and non-profit fundraisers, Rafanelli Events brings distinctive inspiration to everything we do." Randi Events - "We Make The Impossible... Possible." For nearly 17 years in the event industry, music, corporate and individuals have entrusted Randi Lesnick, CEO and founder of Hospitality Consultants, “party planner to the stars,” with their most important occasions. Randi brings depth of business experience to the planning, management, and execution stages. RICHARD NILSSON - "We bring you world class events and top of the line entertainment in the most sophisticated venues." sarah haywood - since 2001. Named Britain's No.1 Luxury Wedding Planner, top-selling bridal author, CNN's Royal Wedding Expert and award winning business woman. International wedding coordination company founded by luxury British wedding planner and designer Sarah Haywood. Named by both Time magazine and Condé Nast Brides as "Britain's most sought after wedding planner" and Paris Match as "one of the most highly rated celebrity wedding planners in the world" Sarah is regularly featured in the international media in her capacity as a wedding expert. Serena Cook - "The Fixer." Serena Cook's Deliciously Sorted is the concierge service and event company for the stars in Ibiza. She's a self-proclaimed "manager of expectations" on an island where guidance and insider knowledge are as essential for a fancy dinner as getting into Amnesia's VIP. She writes a summer column for Tatler, is a spy for Mr and Mrs Smith, runs a sister company International Villas and organises A-list parties. When Paris needs a villa and Mick Jagger wants a chef, they dial Serena's digits first. Super-Luxury Events - "Unique Experiences and Royal Service." We specialise in creating exclusive events to meet the most exclusive of tastes. At Super-Luxury Events, we make sure everyone gets a royal treatment. Whether the requirement is for entirely unique experiences, exclusive first-class events, extreme adventures, top performers, the most spectacular hideaway places, exceptional artworks, the finest of luxury goods and vehicles, or anything else related to our service – we can guarantee the highest standard of super-luxury. The Special Event Company - since 1987. "The Special Event Company is a strategic, creative, one-stop shop for comprehensive meeting and event planning. With 28 years of award-winning special event planning experience, we’ll see that your event is flawless, whether it’s a corporate meeting or a fundraiser for a nonprofit." The Ultimate Events - "Established in 1992, The Ultimate Events Management started off in the industry as an entertainment company catering to mainly corporate annual functions. As the years went by, we immersed ourselves into broader and bolder projects that involved from launches to broadcasting. Today we are actively involved in providing the very best of solutions in the areas of meetings, incentives, conventions and events. Ultimately also represents other firms for their technical back-up assistance for both local and overseas assignments." TLC | Taylor Lynn Corporation - "The Millionaire Party Planner." Corporate Events Organisers, Private Party and Wedding Planners for Manchester, Cheshire and London, the UK and International Locations. In a highly competitive corporate events sector TLC recognise the vital ingredients that contribute towards innovative and memorable occasions. From Conferences to Gala Dinners, TLC tailor make each corporate event to meet the most diverse of briefs and pride themselves on long associations with Blue Chip companies. The first choice of hundreds of private individuals in the planning of amazing birthday celebrations, anniversary parties, Bar Mitzvahs, christenings and a range of breath-taking private events. With an exclusive imagination and attention to detail, TLC has set themselves apart from their competitors. UCN COMMUNICATION - specialized in event organizing and public relations consulting. WCMG - since 2010. "WCMG Events is a full-service event marketing agency." We leave nothing to chance. When you’re relying on a project to be a success: stirring, emotional, persuasive, life-changing, market defining, you need a partner that stops at nothing to make sure that every single aspect is done to perfection. From the big picture of your overall objectives, to a single aspect, our collective has the strategic strength, breadth of vision and practical knowledge to make sure your objectives are met every step of the way. We believe in a holistic approach to visualizing and realizing your marketing, design, and production goals. Together, we will develop unique, powerful, market defining and remarkable experiences. WOLFGANG PUCK - catering & events. "Wolfgang Puck's world class catering services set the standard for dining and events." Yifat Oren & Associates - "Headquartered in Los Angeles, California for more than 12 years, Yifat Oren & Associates provides a full range of event services to a discerning clientele. Yifat and her team create exquisite events, masterfully produced and distinctively designed. Defined by grace and impeccable attention to detail, the company has garnered widespread praise from media, industry experts and high-profile clients."